The “Pacemaker of the Ice Ages” paper by Hays, Imbrie, and Shackleton convinced the uniformitarian scientific community of the validity of the modern version of the Milankovitch hypothesis of Pleistocene ice ages. Spectral analyses performed on data from two Indian Ocean seafloor sediment cores showed prominent spectral peaks at periods corresponding to dominant cycles within the Milankovitch hypothesis. General reasons to question the validity of this iconic paper were presented in Part I of this series. In order to fully understand the methodology used by the paper’s authors, it is necessary to discuss some technical background material regarding Fourier transforms, the Blackman-Tukey method of spectral analysis, and statistical significance. Results from the first part of the Pacemaker paper are then reproduced. The Milankovitch hypothesis is the dominant explanation for the 50 or so supposed Pleistocene ice ages (Walker and Lowe 2007). It was proposed by J. A. Adhémar in 1842, modified by James Croll in the mid to late 1800s, and was later quantitatively refined by Serbian geophysicist Milutin Milanković (Imbrie 1982; Milanković 1941). Summaries of the hypothesis are provided elsewhere (Hebert 2014, 2015, 2016). Despite many difficulties (Cronin 2010, 130–139; Oard 2007), the hypothesis is generally thought to have been elevated to the status of theory by an iconic 1976 paper in Science entitled “Variations in the Earth’s Orbit: Pacemaker of the Ice Ages” (Hays, Imbrie, and Shackleton 1976, hereafter referred to as Pacemaker). 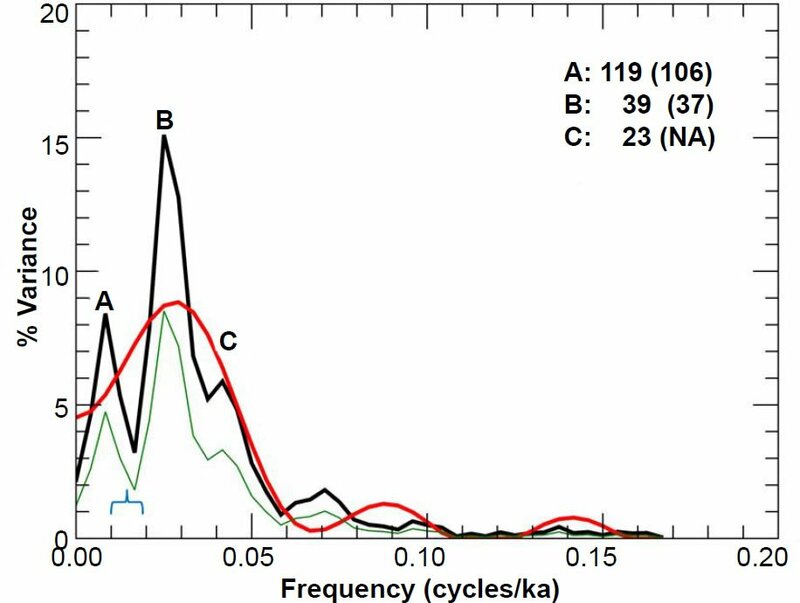 Hays, Imbrie, and Shackleton performed spectral analyses on three variables of presumed climatic significance within the two Indian Ocean sediment cores RC11-120 and E49-18. Spectral analyses of oxygen isotope ratios of the planktonic foraminiferal species Globigerina bulloides, the relative abundance of the radiolarian species Cycladophora davisiana, and (southern hemisphere) summer sea surface temperatures (SST), also inferred from radiolarian data, revealed spectral peaks corresponding to periods of approximately 100, 41, and 23 ka. These periods also correspond to those of dominant cycles in the earth’s orbital motions. Hence, the Milankovitch hypothesis is widely seen as having been confirmed by the Pacemaker paper. Understanding the Blackman-Tukey method in turn requires a brief discussion of Fourier analysis. The constant CN is a normalization constant, which I discuss in more detail later. For now, the key point is that waves characterized by larger amplitudes make a larger contribution to the signal g(t). If one makes a plot of Γ(f) versus frequency f, pronounced peaks will occur at the frequencies of the waves making very large contributions to the signal. One may wonder why each term in the sum of Eq. 6 does not contain a Δt, by analogy with Eq. 2. The discrete Fourier transform is usually defined in such a way that the constant time increment Δt is pulled out of the summation (Press et al. 2007, 607). A plot of spectral power versus frequency obtained in this manner is called a periodogram (Muller and MacDonald 2000, 55).When using a DFT to calculate a periodogram, one often calculates power values for n/2 independent frequencies. This makes sense when one considers the periodogram’s information content. The periodogram contains no information about the phases of the waves comprising the signal, only their frequencies. Hence, the periodogram contains only half the information content of the original n data points (Muller and MacDonald 2000, 49–50). However, practitioners often pad the end of the sequence of n data points with a string of zeros so as to effectively increase the number of data points and hence the periodogram’s frequency resolution (Muller and MacDonald 2000, 60–61). However, such padding complicates assessment of the significance of results (Weedon 2003, 65). If the mean of the signal is non-zero, then Γ(f = 0) will be very large compared to the powers at non-zero frequencies and will tend to dominate the power spectrum. Hence, the data are usually detrended prior to performing a spectral analysis. This can be done by subtracting the mean of the data from each data point or by performing a linear regression on the data (any trend in seafloor sediment data is usually very slight) and then replacing the data by the residuals from the linear regression (Hays, Imbrie, and Shackleton 1976, 1125, 1132; Muller and MacDonald 2000, 50). A particularly fast, efficient way to perform a DFT is via a “Fast Fourier Transform,” or FFT. For those unfamiliar with DFTs and FFTs, detailed discussions are provided in (Press et al. 2007, 608–639). However, because FFTs can be somewhat confusing to the uninitiated (Muller and MacDonald 2000, 51) due to their use of negative frequencies, this paper will not discuss them any further. Given the speed with which modern computers can perform calculations and the relatively small size of the data sets used in the Pacemaker paper, little is gained by using a FFT to perform the calculations. where CN is a normalization constant. I discuss this normalization condition in more detail in the following sections. A DFT requires all the data points to be evenly spaced in time. This is problematic for a number of reasons. First, one rarely encounters evenly spaced times in analyses of seafloor sediment data. Even if measurements are made within a core at equally spaced distance intervals, the times assigned to these distances will almost never be evenly spaced. Obtaining evenly spaced times thus requires the use of an interpolation process. This introduces error, since the spectral analysis is then performed, not on the original data, but on interpolations from that data. Interpolation tends to enhance the power of low frequency components at the expense of the higher frequencies (Schulz and Mudelsee 2002, 421). Unfortunately, most spectral analysis methods require equally spaced data, including the B-T method used in Pacemaker. Second, statisticians would say that the DFT estimator of spectral power has a large variance, and this variance does not decrease with increasing sample size; i.e., estimates of spectral power are erratic (Jenkins and Watts 1968, 211–213). Hence, the estimate for the power spectrum that one obtains is not necessarily equal to the true power spectrum. One would like an estimator of a given quantity to have both low variance and to be unbiased (i.e., estimates for a given parameter are not systematically too high or too low). Unfortunately, these two criteria can be difficult to balance. The B-T method is an attempt to decrease the variance of the spectral estimator while minimizing bias as much as possible. Third, the use of data points that are spaced evenly in time introduces a problem called aliasing: waves of one frequency may be mistaken for waves of another frequency. In order to discuss aliasing, we must introduce a quantity called the Nyquist frequency, the highest frequency that can appear in a DFT (Muller and MacDonald 2000, 50). As a practical matter, one cannot, nor would one wish to, perform calculations using an infinite range of frequencies. What therefore is the appropriate upper frequency limit on Eq. (8)? The problem of aliasing suggests an answer to that question. The time interval Δt separating equally spaced measurements is called the sampling interval, and the reciprocal of the sampling interval is called the sampling frequency, fs. Fig. 1 (after Blackman and Tukey’s Fig. 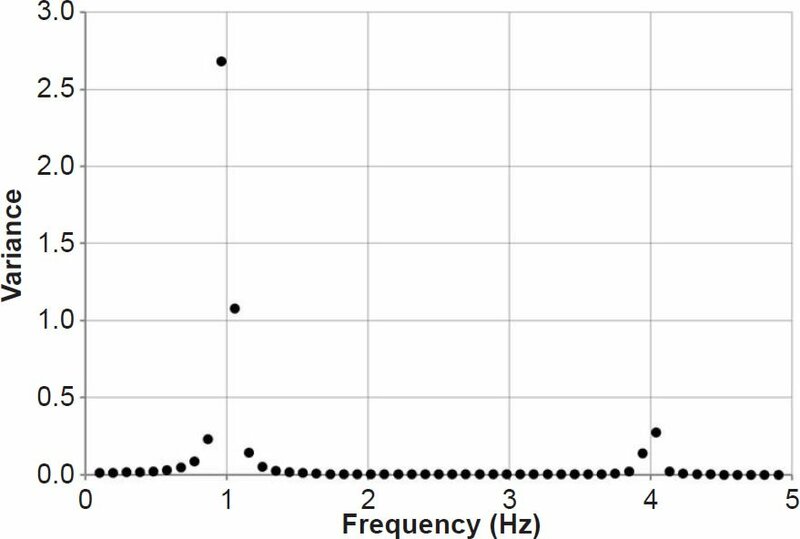 7, 31) illustrates how a set of discrete data points (open black circles) collected at a constant sampling interval of 0.2 s could be caused by either a wave of frequency f = 1 Hz or another wave of frequency f = 4 Hz. This phenomenon is called aliasing. Fig. 1. 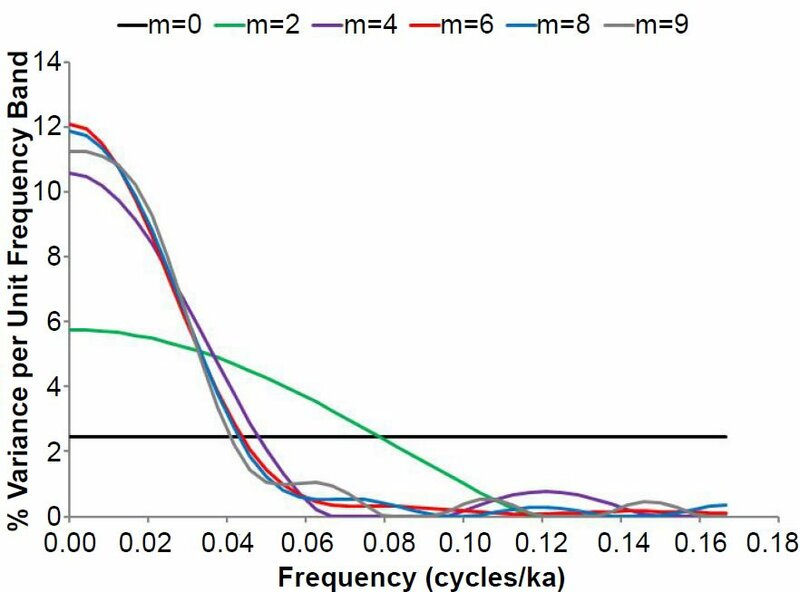 If the open black circles represent actual sampled data points (with a sampling interval of 0.2 s), then these data points could be the result of a wave of frequency f = 1 cycle/second (blue line) or a wave of frequency f = 4 cycles/second (red line). Since the DC component of the signal has been removed by detrending, the smallest frequency of interest, fmin, is 1/T, where T is the total length of time for which data have been collected. Because of aliasing, frequencies higher than the Nyquist frequency can make contributions to the calculated spectral power spectrum. For this and other reasons, our calculated power spectrum is at best an approximation to the true power spectrum. As a practical matter, however, aliasing is not much of a problem in dealing with seafloor sediment data, because processes that blur the signal (such as bioturbation) tend to reduce aliasing effects (Muller and MacDonald 2000, 62). In Eq. (10), the sums are over n/2 non-negative, equally spaced frequencies ranging from fmin = 1/T to fmax = fNyq. Fig. 2 illustrates a signal formed by superposing two different waves, one of frequency 1 Hz and the other of frequency 4 Hz. The 1 Hz wave has an amplitude three times greater than that of the 4 Hz wave. In this case, the time ranged from 0.0 to 10.35 s, with Δt = 0.05 s. The total variance of this signal, in arbitrary units, is 5.0225. Fig. 3 shows the normalized power spectrum for this signal. Although the Nyquist frequency is indeed 10.0 Hz, as one would expect from Eq. (9), I have only plotted spectral power values up to 5.0 Hz, so that the details in the interesting part of the plot may be seen more easily (the rest of the power spectrum is flat). The spectrum is characterized by two dominant peaks located very close to the frequencies of the two waves which comprised the signal. Because none of the discrete frequencies of the transform corresponded to exactly 1 or 4 Hz, these peaks are shifted slightly from the expected frequencies. These small discrepancies result in resolution bias (the picket fence effect): from Eq. (3), one might expect the height of the 1 Hz peak to be exactly nine times greater than the height of the 4 Hz peak. However, this is not the case, due to resolution bias: because the true frequencies of the two waves lie between the specified frequencies of the DFT, the peaks tend to be too low and the troughs tend to be too high (see http://azimadli.com/vibman/thepicketfenceeffect.htm for an illustration). However, in analysis of seafloor sediment data, one generally is not concerned with the precise values of the spectral powers, so the picket fence effect is not of great concern. Fig. 2. Waveform generated by superposing a 1 Hz sine wave (amplitude of 3) with a 4 Hz cosine wave (amplitude of 1). Fig. 3. Power spectrum generated from the waveform in Fig. 2 using a discrete Fourier transform. However, another phenomenon, called spectral leakage, can be more problematic in analysis of seafloor sediment data. Some of the spectral power expected at a particular frequency can be leaked to adjacent frequencies. Little spectral leakage is apparent in Fig. 3, but it is generally more noticeable, with ripples or sidelobes on either side of a true spectral peak. Normalization of the above result was achieved by numerically integrating Eq. 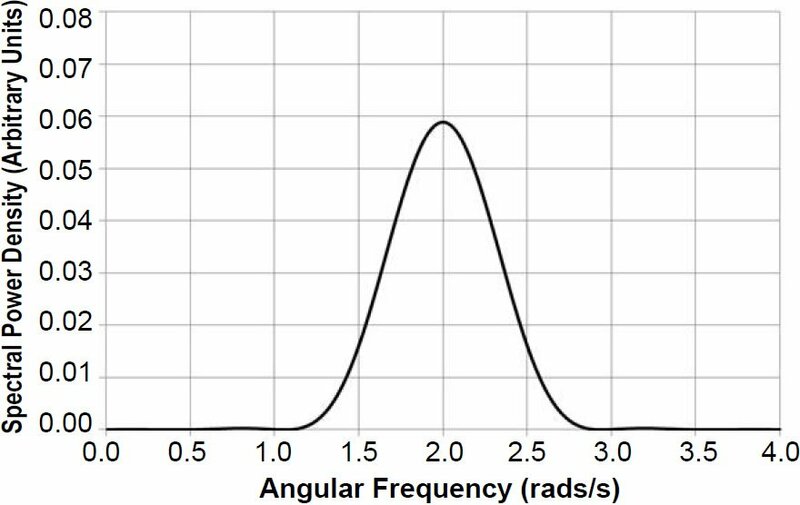 (15) over a range of angular frequencies beyond which the value of Papp(ω) could safely be taken to be essentially zero, i.e., from ω = −20.0 rads/s to ω = +20.0 rads/s, in steps of 0.05 rads/s. This integration yielded a value of 9.968 s, which agrees well with the analytical result: integration of Eq. (15) from negative to positive infinity yields a result of T, or 10.0 s. This result was then equated to the analytically obtained variance of g(t) over the interval t = −T/2 to t = +T/2, i.e., the average value of the square of g(t) from −5.0 s to +5.0 s. Fig. 4 is a graph of the resulting normalized Papp(ω) for ω0 = 2.0 rads/s and T = 10.0 s. In the absence of windowing by the block function, one would expect the power spectrum to consist of a single sharp spike centered on 2.0 rads/s. But because we took the Fourier transform of a sinusoid of finite extent, rather than the original sinusoid of infinite extent, the spectral power was leaked to other frequencies, with the worst leakage occurring for frequencies near ω0. This leakage is characterized by ripples, or sidelobes, to the left and right of the main peak. If a second smaller peak is located near this main peak, the sidelobes surrounding the first peak could potentially bias power estimates for the smaller peak (Muller and MacDonald 2000, 71). This is especially true for high-frequency signals of low amplitude (Weedon 2003, 63). Hence it is often desirable to reduce spectral leakage by use of a taper or window. Fig. 4. 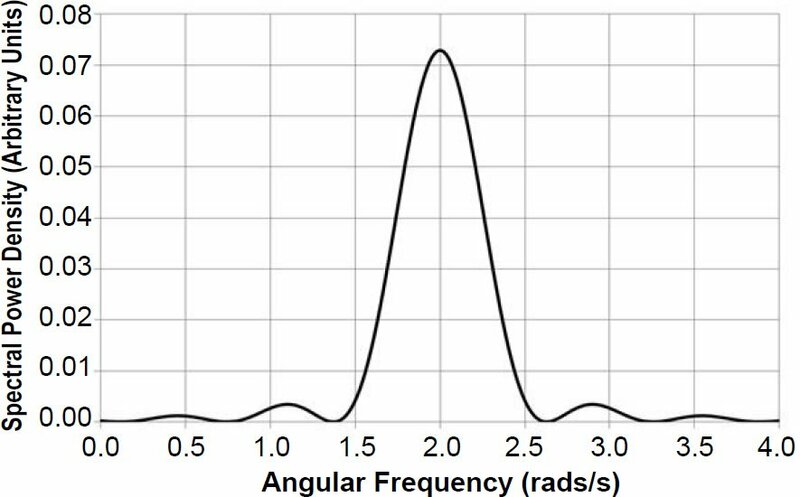 The power spectrum of a simple sinusoidal wave of angular frequency ω0 = 2.0 rads/s demonstrates the phenomenon of spectral leakage. Applying the same normalization procedure used earlier yields the power spectrum shown in Fig. 5. The leakage in Fig. 5 has been reduced, but at the cost of lower resolution: the peak at ω0 = 2.0 rads/s has been broadened, with an accompanying decrease in the amplitude of the central peak. Fig. 5. 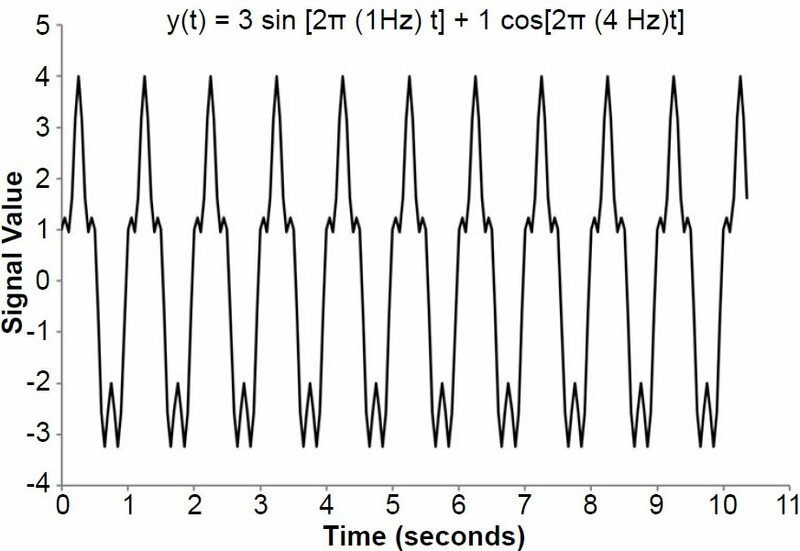 Application of a cosine taper reduces the leakage but at the cost of a broadened spectral peak of lower amplitude. However, it is not the kind of taper, but the width of the taper that is of greatest importance (Jenkins and Watts 1968, 273). This width influences a quantity called bandwidth (discussed below). In this version of the Hamming window, the window will have a value of 1 when l = 0 and a minimum value when l = m. Hence g(t = 0) is unaffected by the Hamming window, but the window effectively reduces g(t = mΔt) to only 8% of its original value. Fig. 6. The choice for the maximum lag m will determine the number of terms in the sum of Eq. (29). designated by i = 0 and the last data point by i = 8. Let us also suppose that we choose our maximum lag to correspond to m = 5. In order to do our calculation for m = 5, we must be able to multiply every g(ti) in our sum by a corresponding g(ti + 5Δt) that is five elements to its right, and this must also be true for the very last element in our sum. Hence, we must count backwards from 5 to 0 from our very last data point (corresponding to i = 8) to determine which data point will be last in the sum. If we do so, we see that this last element corresponds to i = 3. This implies that for l = m = 5, there will be four terms in the sum, as we would expect from Fig. 6. Likewise the denominator in the fraction will be 4Δt. Hence the right side of Eq. 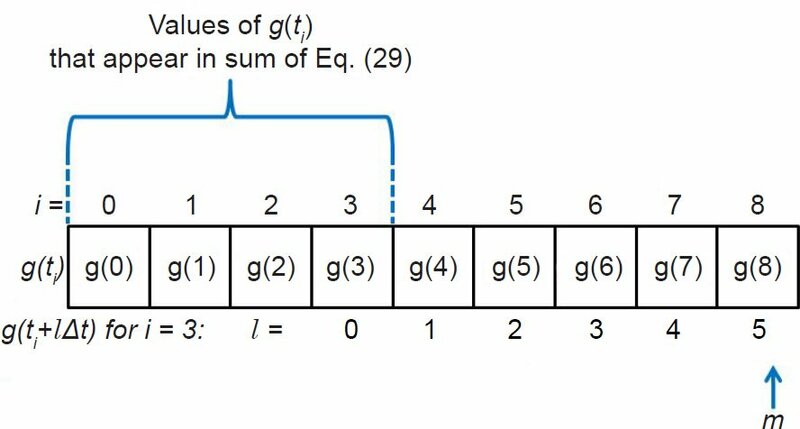 (29) is actually the average value of g(ti)g(ti + lΔt) for the four g(ti) values in the sum, which is consistent with our understanding of Eqs. (24) and (25). Now consider two extreme cases. Suppose that we calculate only one autocovariance value, that corresponding to l = m = 0. In this case, our autocovariance is simply the average of g(ti)2 calculated with nine terms, the maximum possible. On the other hand, suppose we calculate autocovariance values for the maximum possible number of lags (nine). This maximum lag will correspond to m = l = 8. But in order to do this, our average can be calculated with only one term, that corresponding to i = 0. The previous discussion and Eq. (29) give insight into why the B-T method is useful. As just noted, the larger the maximum lag τmax = mΔt, the fewer the number of terms that will appear in the sum. But a small number of terms in the sum implies a poor estimate for the average of g(t)g(t + τ). This implies that our estimator for spectral power will be subject to high variance. Increasing the number of terms in the sum improves the estimate of the average (and hence of spectral power). Hence, this is one reason the B-T method is useful: it is a more stable estimator of spectral power than a DFT, at least for relatively small lags. The B-T method blurs the power spectrum, resulting in a decrease in resolution. However, some degree of blurring is good, as drifts in timescale caused by small changes in sedimentation rate can cause spurious peaks to appear in the power spectrum. The B-T method causes these sidelobes to be absorbed into the real peak, giving a better estimate of spectral power (Muller and MacDonald 2000, 65). The degree of blurring (assuming no windowing) depends on the number of terms that appear in the sum of Eq. (29). The proof is most easily performed using Eqs. (25) (for a finite value of T) and (26). If only 1/3 the total length of time T is used to calculate the integral in the expression for the sample autocovariance, then continuous lag values may be calculated for the remaining 2/3 of the total time. Muller and MacDonald (2000, 64–65) show that this implies that the resolution will be about 3/2 = 1.5 times poorer than would be the case for a simple Fourier transform. However, the use of a smooth taper decreases resolution still further (Muller and MacDonald 2000, 55). Taking the Fourier transform of the unbiased expression for autocovariance found in Eq. (29) would give greatest weight to the autocovariance values calculated with the smallest number of terms. Such an estimator of spectral power would be subject to a very high variance (Jenkins and Watts 1968, 179; Wunsch 2010, 67–68). Hence the biased expression for the sample autocovariance is preferred. Furthermore, multiplying Eq. 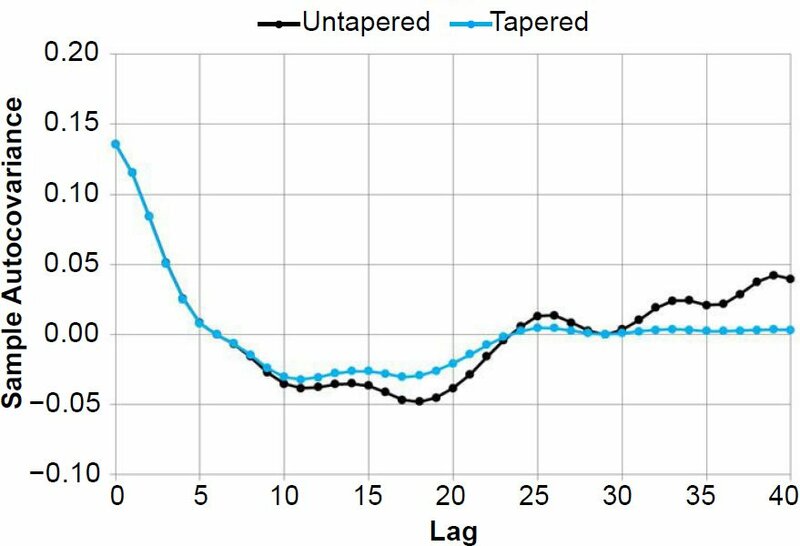 (30) by a taper (such as the Hamming taper) gives still greater weight to autocovariances for smaller lag values, which are calculated with a larger number of terms in the sum. This helps improve still further the estimate of spectral power. Fig. 7 shows sample autocovariance values for m = 40 (untapered, and tapered with a Hamming window) calculated using my reconstructed δ18O values from the RC11-120 sediment core (Hebert 2016), after detrending and interpolation (with Δt = 3 ka). Figure. 7. Untapered and tapered (using a Hamming window) sample autocovariance values calculated for reconstructed δ18O values in the RC11-120 sediment core, with m = 40 (the same value used in the Pacemaker paper). One may wonder why the summation goes to l = m−1 rather than l = m. Because τ = 0 corresponds to l = 0, the index l corresponds to the left-hand side of each time increment Δt, not the right-hand side. If the summation went to l = m, then the sum would include a small contribution from the part of the sample autocorrelation function that is just a little to the right of τ = mΔt, even though we intend to truncate the sample autocorrelation at precisely τ = mΔt (see Jenkins and Watts 1968, 259–260). Now that we have explained the fundamentals of the B-T method, we need to answer the question, what is the appropriate value of m to use for a particular analysis? In order to answer that question, we must briefly discuss a quantity called bandwidth. Our discussion of tapers or windows so far has only involved time domain expressions for these windows. As noted before, time is a function of lag, so these windows are sometimes expressed in terms of the lag value l and are called lag windows w(l). We denote as W(f) the spectral window, which is the Fourier transform (Jenkins and Watts 1968, 245) of w(l). In order to obtain a good estimate of a spectral peak, the width of the narrowest important feature in the spectrum should be roughly the same size as the width of the spectral window W(f) (Jenkins and Watts 1968, 256, 279). Of course, what is considered an important feature by one person may not be considered important by another. Hence, there is a subjective element in the method, and caution must be exercised when using it (Jenkins and Watts 1968, 281–282; Weedon 2003, 85). The uncertainty in the frequency of a peak may be taken to be plus or minus half the bandwidth (Weedon 2003, 59). Blackman and Tukey argued that m should be restricted to a small fraction of the total number of data points (Blackman and Tukey 1958, 11), as do many other experts. However, if one takes seriously the requirement that b be on the order of the width of the smallest important feature in the power spectrum, then a larger value of m may be necessary in order to meet this requirement. Hence Eq. (35) gives us an indication of the approximate value of m that should be used for the spectral analysis. Since the bandwidth should be comparable to the width of the smallest important feature in the spectrum, m should be large enough to ensure that this will be the case, but preferably no larger, since still higher values of m will further decrease the stability of our B-T spectral density estimator. where CN is a normalization constant. Before one can discuss the possible statistical significance of results obtained in a spectrum analysis, one has to first determine the level of background noise. 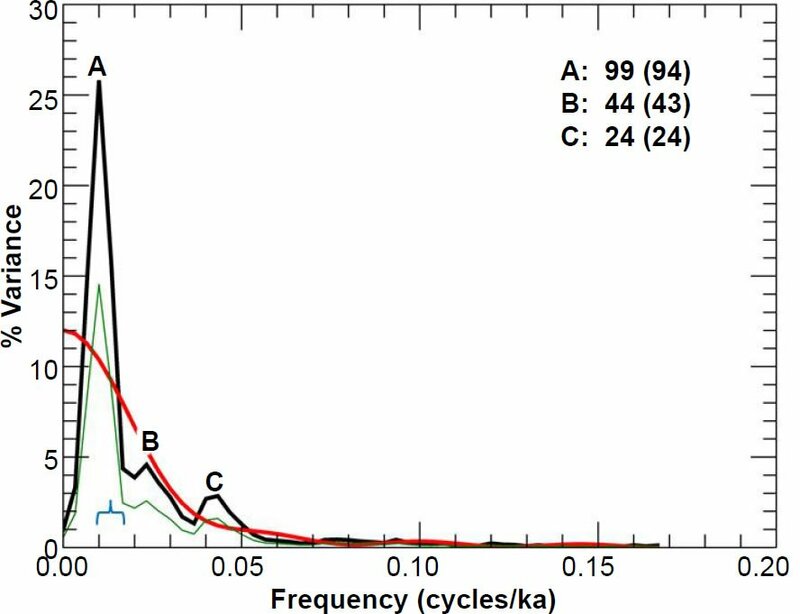 Seafloor sediment spectra are often characterized by red noise (Gilman, Fuglister, and Mitchell 1963). A power spectrum exhibiting red noise behavior can result from a time series generated by a discrete AR-1, or first-order autoregressive random process (Schulz and Mudelsee 2002). For both evenly and unevenly spaced data sets, it is possible to fit red noise models to the data (Mann and Lees 1996; Meyers 2012; Mudelsee 2002; Schulz and Mudelsee 2002). A power spectrum exhibiting red noise is marked by a decrease of spectral amplitude with increasing frequency, with the rate of decrease greatest for lower frequencies. This is in contrast to a spectrum of approximately constant spectral amplitude as a function of frequency (white noise). Another approach to a null continuum is empirically based and does not attempt to assign any particular theoretical generating model as a null hypothesis (Bloomfield 2000). This approach uses a greatly smoothed version of the raw periodogram as the null hypothesis. . . . The estimation of a null continuum by smoothing the periodogram relies on subjective judgement [sic] and trial-and-error. In particular the null continuum should follow just the smooth underlying shape of the distribution of variance over frequency. If smoothed insufficiently, the null continuum will bulge at the important peaks in the spectrum. This would clearly be undesirable as the test of significance of the peak is that it is different from the null continuum. This process is demonstrated in Fig. 8, as power spectra for the detrended and interpolated RC11-120 δ18O values are calculated for values of m equal to 0, 2, 4, 6, 8, and 9. To be consistent with the methodology used in the Pacemaker paper, for all six estimates of the null continuum, the power spectra have been normalized so that the sum of the variances at all frequencies equals unity, or 100%. The higher frequency ripples for some values of m occasionally resulted in slightly negative spectral powers at high frequencies: these negative spectral powers were truncated and set equal to 0.0001 prior to normalization. A small positive number was chosen rather than zero in anticipation of the fact that semi-log plots of spectral power would eventually be needed. The number of frequencies was m + 1, as in the Pacemaker paper. Note that the background curve obtained by setting m = 0 (the smallest possible value of m) is extremely stable but very biased—a flat line. As m is gradually increased, the bias decreases, with the smoothed spectral power estimates near f = 0 becoming much more consistent (~10–12%). As noted earlier, some of the null continua exhibit oscillatory behavior at higher frequencies. One would presumably not expect a background spectrum to do this, so ideally one would like to choose a value of m that minimizes or eliminates this oscillatory behavior. Fig. 8. Process used to determine the null continua for the Blackman-Tukey method. 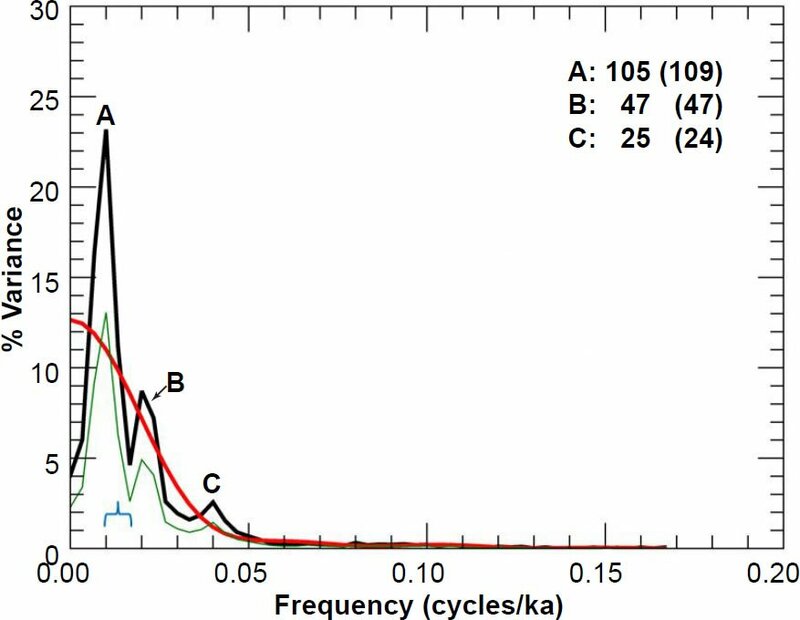 Power spectra are calculated for larger and larger values of m for oxygen isotope values in the RC11-120 core. Higher values of m decrease the bias, but at the cost of increasing instability of the power spectrum estimator. Jenkins and Watts (1968, 263–272) recommended that one obtain the background spectrum by starting with very small value values of m, and increasing those values until still higher values of m do not appreciably decrease the bias. Following the lead of the Pacemaker authors, I will use just a single value of m to obtain the null continua for all three variables. In the δ18O case, a value of m = 6 or m = 7 (the two curves are practically indistinguishable) seems to give the best estimate of the null continuum spectrum: power decreases continuously with increasing frequency, with a greater rate of decrease at low frequencies, and the oscillatory behavior at higher frequencies has been significantly damped. Hence, the null continuum exhibits behavior that roughly approximates that of red noise, as one might expect from a seafloor sediment data set. The SST null continuum also exhibited approximate red noise behavior, with a value of m = 4 yielding the best result, although m values of 5–7 were also acceptable. If one attempts to make the null continuum for % C. davisiana follow the smooth underlying shape of the power spectrum, as suggested by Meko (2015), then a value of m = 9 is probably the best choice, but m values of 6, 7, and 8 also yielded similarly shaped null continua. However, such a null continuum would be noticeably different from a red noise spectrum, with a pronounced hump around f = 0.025 cycles/ka. But since we are not making any assumptions about the underlying stochastic processes involved, I see no reason to assume that all three background curves must necessarily have similar shapes. I decided to follow Meko’s methodology and selected as a compromise a value of m = 7 for these three RC11-120 variables. Once a low-resolution null continuum has been obtained, it becomes possible to perform a test of statistical significance. 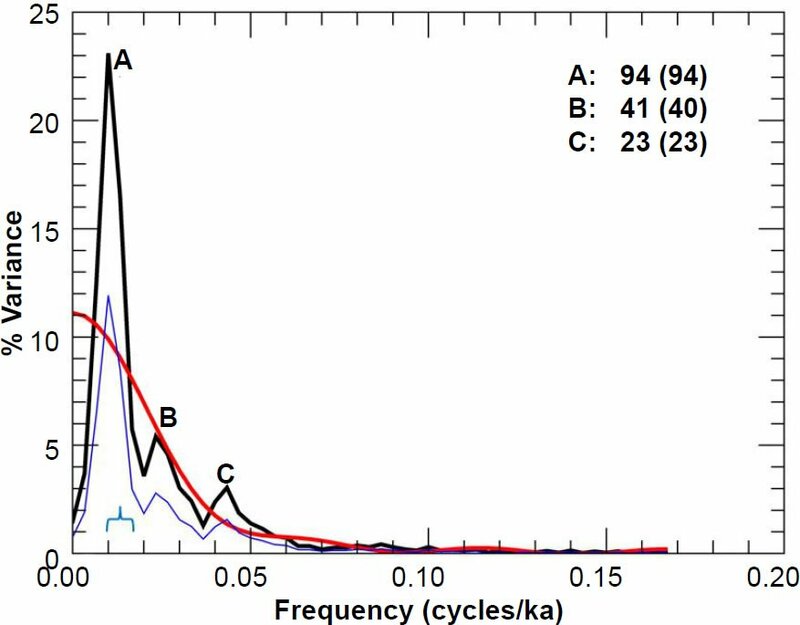 Because paleoclimatologists are expecting peaks at frequencies corresponding to periods of 100, 41, and 23 ka, we need to test whether or not these particular peaks are significant if they appear in the spectra. In other words, a priori statistics are appropriate, rather than a posteriori (Hartmann 2013, 168–169). where Pest(f) is our estimated value of the spectral density function obtained from the B-T method, and χ2 is the chi-squared distribution. In Eq. (38), ν is the number of degrees of freedom of the smoothed spectral estimator, an integer greater than 2. Note that the confidence interval does not mean that there is a probability p that for a particular (already calculated) frequency-dependent estimate of spectral power, that the true value of the spectral power lies within the bounds of the corresponding confidence interval. Because the true value of the spectral density is an unknown constant and not a random value, it does not make sense to speak of a probability that it lies between two fixed values. Although this is a common misconception (Mayo 1981, 272), the correct understanding of the confidence interval is the following: if one were to perform many similar statistical experiments (with apparently identical starting conditions) and to estimate the population parameter in each case (i.e., the spectral power at a given frequency) along with the corresponding confidence intervals (which can vary from sample to sample), one would expect the true values of the power spectra to fall within the bounds of the corresponding confidence intervals in 100p percent of those cases. This result is confirmed for the Hamming window elsewhere (Thomson and Emery 2014, 479). Thus, if one strictly follows the methodology presented in texts on spectral analysis, it seems that the Pacemaker authors may have understated the number of degrees of freedom for their statistical analysis. Ironically, the error would have worked against them, as a larger number of degrees of freedom implies, for a given value of α, a narrower confidence interval. This in turn implies that even spectral peaks of moderate height may still be significant, as the lower bound of the confidence interval may still fall above the null continuum. Perhaps the Pacemaker authors were attempting to be conservative by using the smaller estimate for ν. Some argue that in the likely case that the calculated value of ν is not an integer, one should round down to the nearest integer in order to be conservative (Honerlaw n.d., 3). However, this may be too stringent, as it seems unreasonable to use a value of ν = 4 if, for example, the calculated value for ν is actually 4.9. For example, suppose one wanted to calculate the 90% confidence interval for a power spectrum calculated using n = 300 data points and a maximum lag m = 60. The appropriate number of degrees of freedom is v = 2.516(300) / 60 ≈ 13. One would then set p equal to 0.90 and solve for the appropriate value of α (in this case, 0.10). For a given frequency, the upper and lower bounds of the spectral power estimate would then be given by Eqs. (38) after using either a table or a computer to obtain the appropriate χ2 values for α = 0.10 and ν = 13. Weedon (2003, 69, 71) notes that 8–14 degrees of freedom are generally used in cyclostratigraphic studies, with 8 normally considered a bare minimum. In that light, it is interesting to note that the Pacemaker authors used only 6–7 degrees of freedom in their analysis based on Eq. (39) and the information from their Table 4. Of course, the number of degrees of freedom is highly subjective (Weedon 2003, 69), as one would expect from the fact that the choice of m is subjective. Weedon (2003, 82) presents us with the criterion for determining whether or not a spectral peak is significant: “If the range of uncertainty of a particular spectral peak value does not overlap with the continuum spectrum, that peak can be considered to be statistically distinguishable from the background.” In other words, if the lower bound of the confidence interval for a spectral peak lies above the continuum spectrum, then the peak is statistically distinguishable from the background. When evaluating statistical significance, it is expedient to plot the power spectrum on a semi-log graph for two reasons. First, smaller spectral peaks are simply easier to see when plotted on a semi-log graph. Second, the difference between the natural log of the upper bound and the natural log of the lower bound will be equal to a constant, regardless of frequency (Jenkins and Watts 1968, 255). Hence one can indicate for any frequency the depth of the lower bound of a confidence interval (measured downward from the estimated value of the power spectrum) with an arrow of fixed length. However, given the ease with which modern computer software can calculate and plot these upper and lower bounds for multiple frequency values, one could just as easily overlay the upper and lower bounds on plots of the natural log of the power spectra. We are making a number of implicit assumptions in assessing statistical significance. First, we are assuming that the realized values of the random variables (the δ18O and SST values, etc.) are generated by a stationary stochastic (or random) process. A process is stationary if the statistical properties of the process are independent of absolute time. True stationarity (and Gaussianity) have been described as “fairy tales invented for the amusement of undergraduates” (Thomson 1994, cited in Anava et al. 2013, 1). Hence, paleoclimatologists often settle for weak stationarity or second-order stationarity: the process is described by a finite, time-independent mean, a finite variance, and an autocovariance which depends only upon the lag (separation) between two time values, not the absolute time (Hu 2006, 3). There are rigorous tests which may be performed to ensure weak stationarity, but in actual practice many analysts do not bother to use them (Nason 2014)! Power spectral estimates are most precise when the power is distributed evenly over all frequencies. In many cases it is found that the power has one or more broad peaks. The average value of the power at any particular frequency, f, may be greatly distorted during computation since the effect of a spectral window is to spread the power from the large peaks into adjacent frequencies. To avoid this difficulty the data is [sic] passed through a filter which compensates or pre-emphasizes the frequencies with lower amplitudes. This process of bringing the resultant spectrum close to that of white noise is called prewhitening. Such flattening of the spectrum need not be precise; it is only necessary to ensure that the rate of change of the power spectrum with frequency is relatively small (Blackman and Tukey 1958, 29). The intensity of the prewhitening is controlled by the constant C, which can vary between 0 and 1. If C = 1, the effect is very similar to that of taking a derivative. This has the effect of multiplying each spectral power P(f) by f2 (see Muller and MacDonald [2000, 94–95] for a discussion of why this is the case), which enhances the power at higher frequencies (at the cost of spectral power at lower frequencies). There is no single value for C that will work in every situation; one just has to experiment with different values of C to see which value does the best job of flattening the spectrum (Muller and MacDonald 2000, 95). Most scientists do not bother to prewhiten seafloor sediment data. Even the Pacemaker paper refers to this step as optional (Hays, Imbrie, and Shackleton 1976, 1125), as uncertainties in timescales and high signal-to-noise ratios are thought to make this step unnecessary (Muller and MacDonald 2000, 95). However, based upon the above discussion, it would seem to be a necessary step when attempting to rigorously evaluate statistical significance, unless one has already verified the assumption of weak stationarity for the original data set. However, analysts often plot confidence intervals (without prewhitening) even for spectra which exhibit red noise characteristics, an acceptable practice provided that the statistical inference is supported by physical reasoning and/ or a need for statistical rigor is not too pressing (Wunsch 2010, 69). Since prewhitening would seem to be a requirement for a rigorous test of statistical significance, and because the prewhitening process diminishes the heights of low-frequency peaks relative to the higher frequency peaks, does this mean that a rigorous test of significance of the low-frequency peaks cannot be performed using the Blackman-Tukey method? Perhaps not, but this is not too problematic, since a completely rigorous test of significance is not absolutely necessary if one is already expecting a particular prominent low-frequency peak (Wunsch 2010, 69). Of course, this is indeed the case here, as Milankovitch theory predicts the existence of a low-frequency peak at about 0.01 cycles/ka (corresponding to a period of 100 ka). Now that I have explained the theory behind the B-T method, I here reproduce the results from Fig. 5 and Tables 3 and 4 of the Pacemaker paper using an IDL (Interactive Data Language) code that I entitled bt_original.pro. In doing so, I have followed the procedure described on p. 1125 of the Pacemaker paper. Some of the high-frequency spectral power and null continua estimates would occasionally be slightly negative. This was especially true of the null continua, which sometimes exhibited high-frequency oscillatory behavior. The Pacemaker authors did not explicitly describe how they handled this difficulty. I truncated those values, setting them equal to a very small positive value (0.0001) in anticipation of the fact that I will eventually take the natural log of the spectral powers. After truncation, the spectra were normalized and expressed as a percentage of the total variance per unit frequency band. However, for the RC11-120 power spectra, truncation was only necessary for eight spectral values in the high-frequency portion of the % C. davisiana null continuum. I have gone ahead and plotted the null continuua and lower bounds of the 80% confidence intervals in order to give the reader a feel for the relative heights of the peaks relative to the background. However, I recognize that a truly rigorous test of significance must be postponed until after the prewhitening process (in Part III of this series). My (unprewhitened) spectral results for the RC11-120 core, using their SIMPLEX timescale and an assumed age of 700 ka for the Brunhes- Matuyama magnetic reversal boundary, are shown in Figs. 9–11. Given that the SIMPLEX age model assumed a constant sedimentation rate, one might assume that it would not be necessary to interpolate the data, since a constant sedimentation rate implies a constant time increment between equidistant data points. However, there is still some round-off error, even with high-precision computing. Hence, it is still necessary to set Δt to an exact value and to interpolate. As described in Pacemaker, I interpolated the data, using a time difference Δt = 3 ka. This resulted in a Nyquist frequency of 0.167 cycles/ka and n = 92 data points. The Pacemaker authors reported n = 91, but it appears that they excluded the time t = 0 ka from their count, as my timescale extends from 0 to 273 ka, as theirs did (see their Table 3 and caption). Either that, or their n = 91 refers to the prewhitened data set, since prewhitening reduces the number of elements in the time series by 1. I used a maximum lag value of m = 40, as they did. The number of frequencies was set to m + 1, per the previous discussion. In order to obtain the best possible period estimates, I also reran my code, setting the number of frequencies equal to 3m instead of m + 1. Although I have reproduced the lower resolution graphs (for ease of comparison with the original Pacemaker results), my period estimates are based upon the higher resolution results. Also, for all these results (Figs. 9–17), I have labelled the periods (in ka) corresponding to the frequencies of dominant peaks, with the original periods reported by the Pacemaker authors in parentheses next to my reported values. The Pacemaker estimates for the dominant periods were “weighted mean cycle lengths” (Hays, Imbrie, and Shackleton 1976, 1126). The Pacemaker authors did not elaborate on this, but I presume they meant that a particular weighted average involved either all frequencies that fell within the estimated full width at half maximum for a particular peak, or that it involved just the handful of frequencies in the vicinity of the very top of the peak. In most cases, my high-resolution peaks exhibited smooth, rounded tops, making it quite easy to estimate the central frequency of the peak. In some cases, however, slanted peaks (such as the A and B peaks in Fig. 9) were still present, even in the higher-resolution spectra. In those cases, I obtained a weighted mean cycle length using just the handful of frequencies in the immediate vicinity of the very top of the peak. Despite this ambiguity in methodology, my peak period values generally agreed very well with those originally reported in the Pacemaker paper. Fig. 9. Unprewhitened RC11-120 (southern hemisphere) summer sea surface temperature power spectrum. Numbers in bold indicate the periods (in ka) of prominent spectral peaks, and numbers in parentheses are the periods originally reported in the Pacemaker paper. The smooth red curve represents the null continuum, the light green line represents the lower bound of the 80% confidence interval, and the blue bracket indicates the approximate bandwidth. As noted earlier, I have also included the null continua and the lower bounds of the 80% confidence intervals to help the reader get a feel for the height of spectral peaks compared to the backgrounds. The reason for doing so should hopefully become apparent in Part III of this series, although I recognize that a rigorous analysis of statistical significance must be postponed until prewhitening. I have also included a light blue bracket to indicate the approximate equivalent bandwidth (width of the bracket may disagree slightly with the calculated bandwidth, due to resolution limitations), after Eq. (35). A value of m = 7 was used to obtain the null continua for all three variables in the RC11-120 core. Note that their percentage variance values are about half of mine; the Pacemaker authors apparently plotted Γ(f), rather than P(f), in their Fig. 5. Overall, there is good agreement between the shapes of my spectra and theirs, as well as generally good agreement between the periods of my dominant peaks and theirs. Although I have not received legal permission to reproduce their results in this paper (reproduction of figures from Science papers published between 1974 and 1994 require the author’s permission, and my request for this permission went unanswered), an internet search should quickly locate a picture of their Fig. 5, so that their results may be compared with mine. Despite the generally good visual match between my results and theirs, in some cases there is noticeable disagreement. For instance, there are some noticeable differences between my Fig. 11 and their chart in the upper right-hand corner of their Fig. 5 (the RC11-120 spectrum results for % C. davisiana). The trough between peaks A and B in my Fig. 11 is not as deep as it was in Pacemaker. Likewise, they did not report a period value for my peak C, since their graph exhibits more of a plateau than a peak at that location. There were also some differences between my reported peak periods and theirs. My period of 119 ka for peak A in Fig. 11 is noticeably larger than their reported value of 106 ka. However, my period of 102 ka for peak A in Fig. 9 is actually a better match to the expected 100 ka value than the originally reported value of 87 ka. The same is true for my peak A in Fig. 10. Fig. 10. Unprewhitened RC11-120 oxygen isotope power spectrum. Numbers in bold indicate the periods (in ka) of prominent spectral peaks, and numbers in parentheses are the periods originally reported in the Pacemaker paper. The smooth red curve represents the null continuum, the light green line represents the lower bound of the 80% confidence interval, and the blue bracket indicates the approximate bandwidth. Fig. 11. Unprewhitened RC11-120 %. C. davisiana power spectrum. Numbers in bold indicate the periods (in ka) of prominent spectral peaks, and numbers in parentheses are the periods originally reported in the Pacemaker paper. The smooth red curve represents the null continuum, the light green line represents the lower bound of the 80% confidence interval, and the blue bracket indicates the approximate bandwidth. Also, my peaks tend to not be as sharp as those in the original Pacemaker paper. Some of this may be due to the inherent error of attempting to reconstruct the data from Figs. 2 and 3 in Pacemaker. 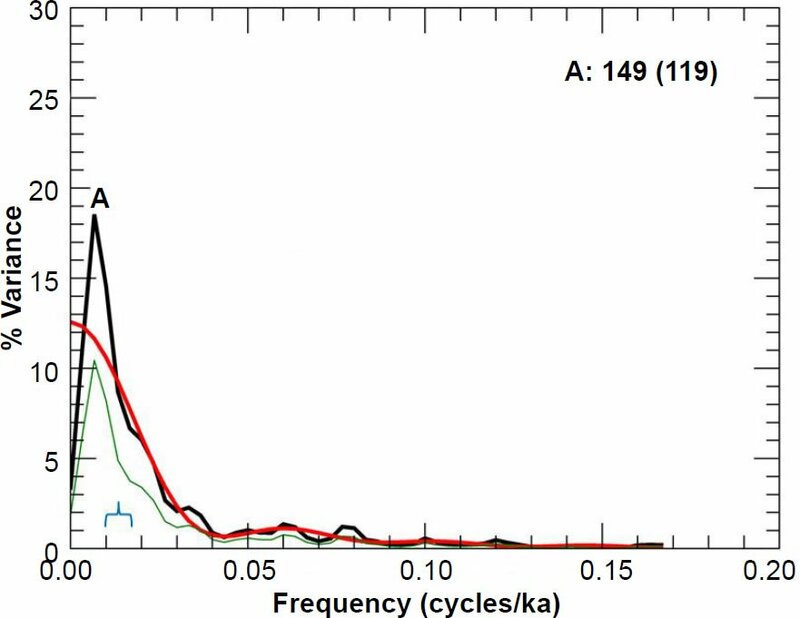 Likewise, my unprewhitened spectral results for the E49-18 core (using the SIMPLEX chronology) are shown in Figs. 12–14. Per the Pacemaker paper, I also used a time increment of Δt = 3 ka. Interpolation resulted in n = 122 data points. As before, this was one greater than their reported value of n = 121, but my interpolated timescale extends from t = 127 ka to t = 490 ka, in very good agreement with their reported timescale of 127–489 ka. Fig. 12. Unprewhitened E49-18 summer sea surface temperature power spectrum. Numbers in bold indicate the periods (in ka) of prominent spectral peaks, and numbers in parentheses are the periods originally reported in the Pacemaker paper. The smooth red curve represents the null continuum, the light green line represents the lower bound of the 80% confidence interval, and the blue bracket indicates the approximate bandwidth. Fig. 13. Unprewhitened E49-18 oxygen isotope power spectrum. Numbers in bold indicate the periods (in ka) of prominent spectral peaks, and numbers in parentheses are the periods originally reported in the Pacemaker paper. The smooth red curve represents the null continuum, the light green line represents the lower bound of the 80% confidence interval, and the blue bracket indicates the approximate bandwidth. Fig. 14. Unprewhitened E49-18 % C. davisiana power spectrum. Number in bold indicates the period (in ka) of the prominent spectral peak, and the number in parentheses is the period originally reported in the Pacemaker paper. The smooth red curve represents the null continuum, the light green line represents the lower bound of the 80% confidence interval, and the blue bracket indicates the approximate bandwidth. I chose m = 8 to obtain the null continua, as this choice seems to give the best overall null continua estimates for all three variables. As in the case of the RC11-120 spectra, I have also included the lower bounds of the 80% confidence intervals in my graphs. There is a generally good visual match between my reproduced spectra and those depicted in the second row of Fig. 5 in Pacemaker. However, there is a major discrepancy between their reported period of 119 ka for the dominant A peak in the % C. davisiana power spectrum and my value (Fig. 14) of 149 ka. Very little truncation was required in this case. Only three high-frequency spectral values within the E49-18 δ18O power spectrum were slightly negative. Finally, I include in Figs. 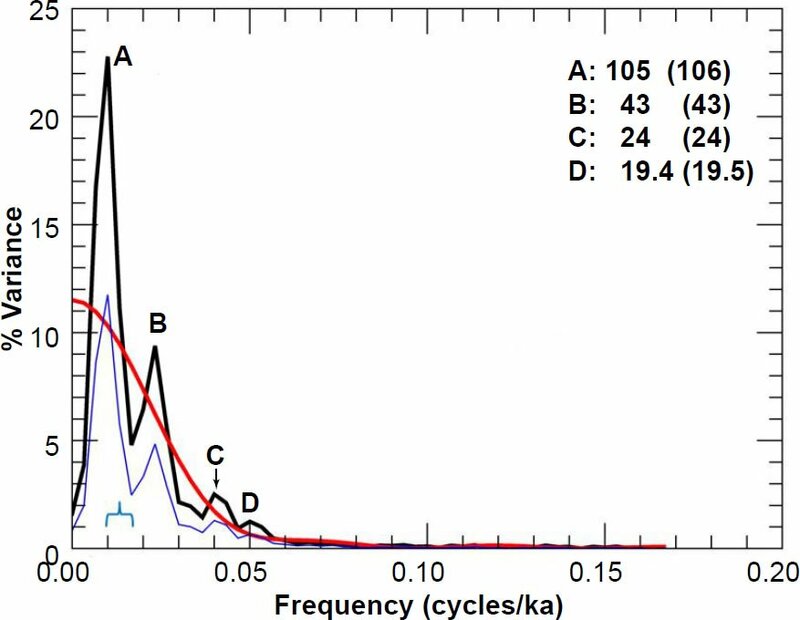 15–17 the power spectra for the ELBOW chronology and the PATCH records, obtained by appending data from the top 785 cm in the RC11-120 core to the data below 825 cm in the E49-18 core. The Pacemaker authors thought they could do this because the depth of 785 cm in the RC11-120 core and the depth of 825 cm in the E49- 18 core both corresponded to the presumed MIS 8-7 boundary, to which they assigned an age of 251 ka. Figs. 15–17 correspond to the third row of charts in their Fig. 5. In order to obtain their null continua in a later part of the paper, the authors set m = 8 (Hays, Imbrie, and Shackleton 1976, 1132, endnote no. 57), although I think m = 7 gives an overall better fit for the prewhitened results (discussed in a later paper). This discrepancy could be due to slight differences between the original and my reconstructed data sets. Again, there is generally favorable agreement between my results and those in Pacemaker. Fig. 15. Unprewhitened PATCH summer sea surface temperature power spectrum. Numbers in bold indicate the periods (in ka) of prominent spectral peaks, and numbers in parentheses are the periods originally reported in the Pacemaker paper. The smooth red curve represents the null continuum, the light blue line represents the lower bound of the 90% confidence interval, and the blue bracket indicates the approximate bandwidth. Fig. 16. Unprewhitened PATCH oxygen isotope power spectrum. Numbers in bold indicate the periods (in ka) of prominent spectral peaks, and numbers in parentheses are the periods originally reported in the Pacemaker paper. The smooth red curve represents the null continuum, the light blue line represents the lower bound of the 90% confidence interval, and the blue bracket indicates the approximate bandwidth. The “D” peak is not labelled in Fig. 5 of Pacemaker, but it is listed in that paper’s Table 4. Fig. 17. Unprewhitened PATCH % C. davisiana power spectrum. Numbers in bold indicate the periods (in ka) of prominent spectral peaks, and numbers in parentheses are the periods originally reported in the Pacemaker paper. The smooth red curve represents the null continuum, the light blue line represents the lower bound of the 90% confidence interval, and the blue bracket indicates the approximate bandwidth. Only one high-frequency spectral value within the PATCH δ18O power spectrum needed to be truncated, as well as four values in the high-frequency portion of the PATCH SST null continuum. For the three PATCH spectra, I have also plotted the lower bounds of the 90% confidence intervals. Now that we have explained the Blackman-Tukey method and demonstrated that my code can replicate, using the same multi-step procedure described by the Pacemaker authors, the original results with a good deal of precision, it is now time to discuss in Part III of this series the statistical significance of the original results, as well as the effect of the new age assignment for the B-M reversal on the resulting power spectra. We also discuss the effect of including all the E49-18 data in the analysis. Unfortunately for proponents of Milankovitch climate forcing, these effects are quite negative. Anava, O., E. Hazan, S. Mannor, and O. Shamir. 2013. “Online Learning for Time Series Prediction.” Journal of Machine Learning Research: 2013 Workshop and Conference Proceedings: 1–13. Arfken, G. B., and H. J. Weber. 2005. Mathematical Methods for Physicists. 6th ed. Amsterdam, The Netherlands: Elsevier. Blackman, R. B., and J. W. Tukey. 1958. The Measurement of Power Spectra from the Point of View of Communications Engineering. New York, New York: Dover Publications. Buttkus, B. 2000. Spectral Analysis and Filter Theory in Applied Geophysics. English ed. Berlin, Germany: Die Deutsche Bibliothek. Cronin, T. M. 2010. Paleoclimates: Understanding Climate Change Past and Present. New York, New York: Columbia University Press. Gilman, D. L., F. J. Fuglister, and J. M. Mitchell, Jr. 1963. “On the Power Spectrum of ‘Red Noise’.” Journal of the Atmospheric Sciences 20 (2): 182–184. Hartmann, D. L. 2013. Classroom Notes for Spectral Analysis. http://www.atmos.washington.edu/~dennis/552_Notes_6b.pdf. Hayes, J. D., J. Imbrie, and N. J. Shackleton. 1976. “Variations in the Earth’s Orbit: Pacemaker of the Ice Ages.” Science 194 (4270): 1121–1132. Hebert, J. 2014. 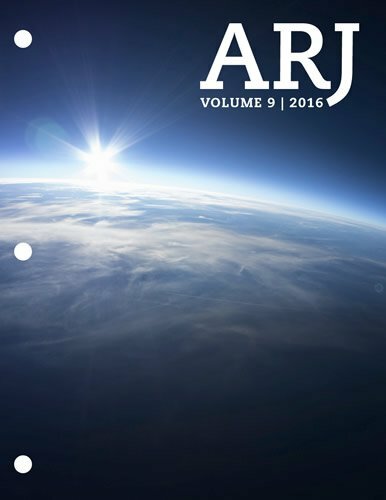 “Circular Reasoning in the Dating of Deep Seafloor Sediments and Ice Cores: The Orbital Tuning Method.” Answers Research Journal 7: 297–309. Hebert, J. 2015. “The Dating ‘Pedigree’ of Seafloor Sediment Core MD97-2120: A Case Study.” Creation Research Society Quarterly 51 (3): 152–164. Hebert, J. 2016. “Revisiting an Iconic Argument for Milankovitch Climate Forcing: Should the ‘Pacemaker of the Ice Ages’ Paper Be Retracted? Part I.” Answers Research Journal 9: 25–56. Honerlaw, M. n.d. Purdue University Statistics class notes. http://www.stat.purdue.edu/~mhonerla/stat301/Chapter_7.pdf. Hu, L. 2006. Lecture 1: Stationary Time Series. Lecture Notes for Ohio State University Economics Class. http://www. econ.ohio-state.edu/dejong/note1.pdf. Imbrie, J. 1982. “Astronomical Theory of the Pleistocene Ice Ages: A Brief Historical Review.” Icarus 50 (2–3): 408–422. Imbrie, J., and N. Pisias. n.d. Climap Handbook of Time-Series Analysis. Archived as Columbia University class notes for Cenozoic Paleoceanography course (as of 10/27/2015). http://eesc.columbia.edu/courses/w4937/Readings/Climap_handbook_Time_Series.pdf. Jenkins, G. W., and D. G. Watts. 1968. Spectral Analysis and Its Applications. San Francisco, California: Holden-Day. Kanasewich, E. R. 1985. Time Sequence Analysis in Geophysics. 3rd ed. Alberta, Canada: University of Alberta Press. Khintchin, A. 1934. “Korrelationstheorie der stationären stochastischen Prozesse.” Mathematische Annalen 109 (1): 604–615. Mann, M. E., and J. M. Lees. 1996. “Robust Estimation of Background Noise and Signal Detection in Climatic Time Series.” Climatic Change 33 (3): 409–445. Mayo, D. G. 1981. “In Defense of the Neyman-Pearson Theory of Confidence Intervals.” Philosophy of Science 48 (2): 269–280. Meko, D. 2015. University of Arizona Classroom notes for Dendrochronology 585A. http://www.ltrr.arizona.edu/~dmeko/notes_6.pdf. Meyers, S. R. 2012. 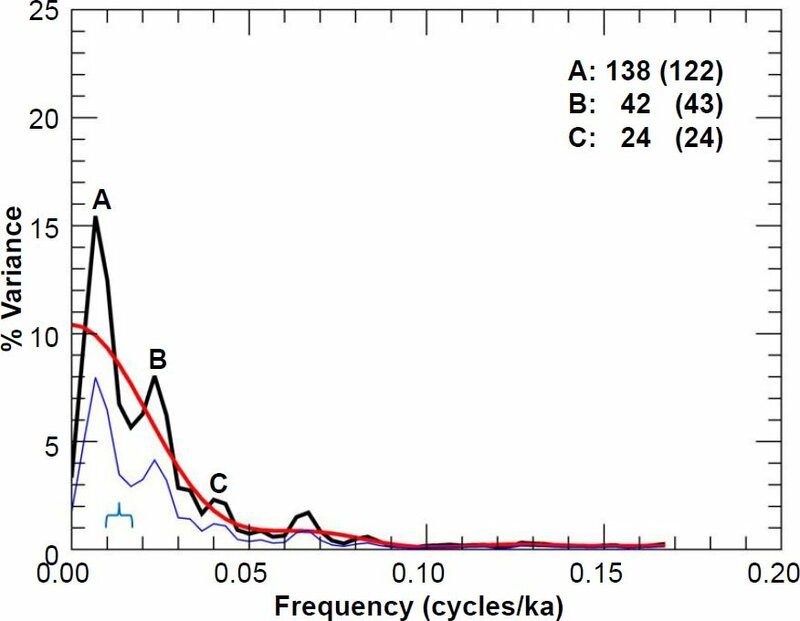 “Seeing Red in Cyclic Stratigraphy: Spectral Noise Estimation for Astrochronology.” Paleoceanography 27 (3): 1–12. Milankovic, M. 1941. 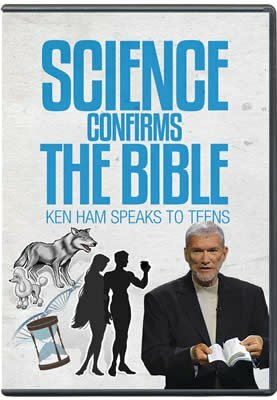 Canon on Insolation and the Ice-Age Problem. Belgrade, Serbia: Special Publications of the Royal Serbian Academy, vol. 132. Mudelsee, M. 2002. “TAUEST: A Computer Program for Estimating Persistence in Unevenly Spaced Weather/ Climate Time Series.” Computers and Geosciences 28 (1): 69–72. Muller, R. A., and G. J. MacDonald. 2000. Ice Ages and Astronomical Causes: Data, Spectral Analysis and Mechanisms. Chichester, United Kingdom: Praxis Publishing. Nason, G. 2014. Tests of Stationarity. University of Bristol School of Mathematics. http://www.maths.bris.ac.uk/~guy/Research/LSTS/TOS.html. Oard, M. J. 2007. “Astronomical Troubles for the Astronomical Hypothesis of Ice Ages.” Journal of Creation 21 (3): 19–23. Press, W. H., S. A. Teukolsky, W. T. Vetterling, and B. P. Flannery. 2007. Numerical Recipes: The Art of Scientific Computing. 3rd ed. Cambridge, United Kingdom: Cambridge University Press. Schulz, M., and M. Mudelsee. 2002. 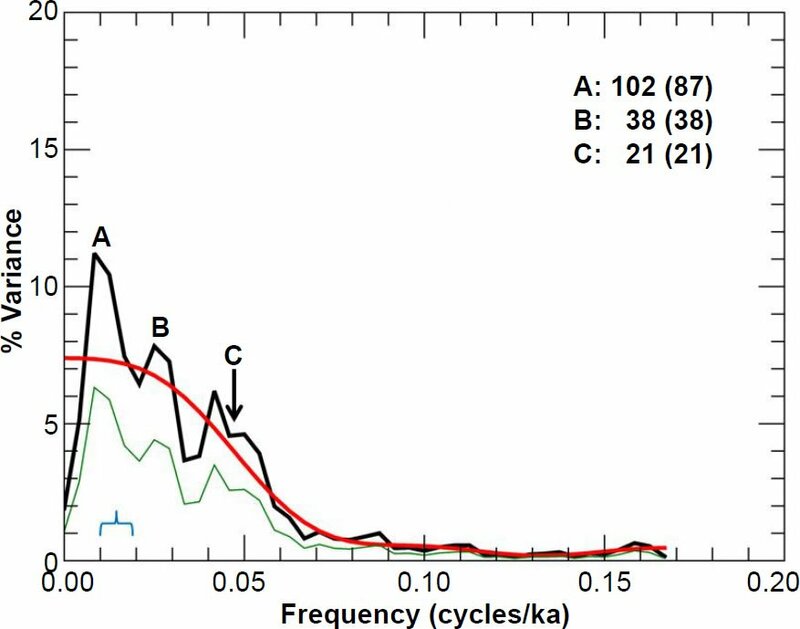 “REDFIT: Estimating Red- Noise Spectra Directly from Unevenly Spaced Paleoclimatic Time Series.” Computers and Geosciences 28 (3): 421–426. Spiegel, M. R. 1994. Schaum’s Outline Series: Mathematical Handbook of Formulas and Tables. 3rd ed. New York, New York: McGraw-Hill. Thomas, G. B. Jr., and R. L. Finney. 1988. Calculus and Analytic Geometry. 7th ed. Reading, Massachusetts: Addison-Wesley. Thomson, R. E., and W. J. Emery. 2014. Data Analysis Methods in Physical Oceanography. 3rd ed. Amsterdam, The Netherlands: Elsevier. Walker, M., and J. Lowe. 2007. “Quaternary Science 2007: A 50-Year Retrospective.” Journal of the Geological Society, London 164 (6): 1073–1092. Weedon, G. P. 2003. 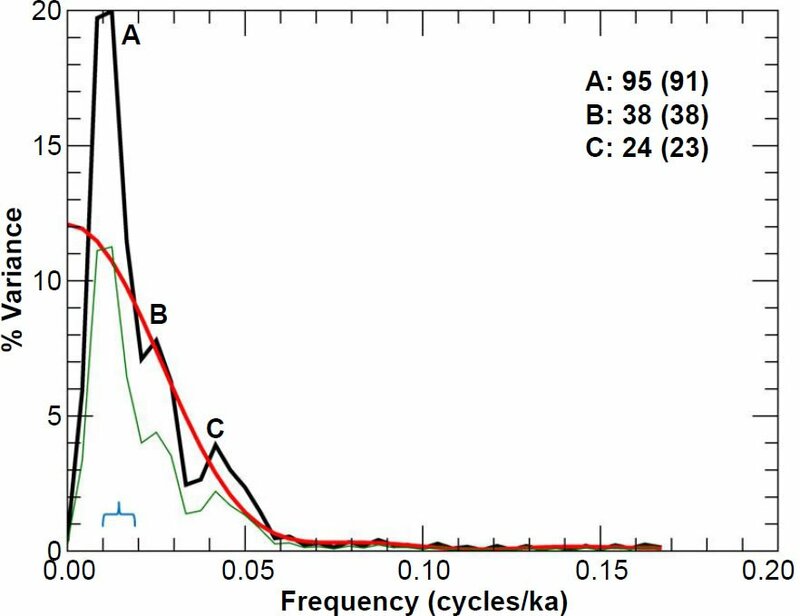 Time-Series Analysis and Cyclostratigraphy: Examining Stratigraphic Records of Environmental Cycles. Cambridge, United Kingdom: Cambridge University Press. Wiener, N. 1930. “Generalized Harmonic Analysis.” Acta Mathematica 55 (1): 117–258. Wunsch, C. 2010. Time Series Analysis: A Heuristic Primer. Classroom Notes. http://isites.harvard.edu/fs/docs/icb.topic719287.files/time_series_primer_22jan2010.pdf.